In the past, US food halls were a mere collection of food-related proprietors in a tourist hotspot, but the modern food hall is a cultural experience… [F]ood halls include a mix of tenants that offer both prepared and unprepared food, usually with an artisanal bend to it. This includes food vendors, farm-to-fork vendors and quality, authentic restaurants. Anyone familiar with Columbus will tell you that the North Market is a must-stop location while visiting. Open since 1876, this historic public market offers more than 30 merchants selling organic produce, locally roasted coffee, baked goods, cheeses, flowers and an international selection of freshly prepared foods. This cherished landmark is home to the first-ever location of the highly acclaimed Jeni’s Splendid Ice Creams and it’s newest tenant, Momo Ghar, was just featured in Food & Wine. 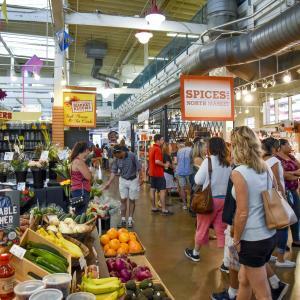 Situated in the heart of downtown, just two blocks from the convention center, the North Market is the perfect spot to grab a quick bite between sessions or a unique rental for after-hours receptions. This year, two new food halls will join the Columbus food scene. Coming soon, the first will be Short North Food Hall, brought to us by the minds behind Pint House, Forno and Standard Hall. Aptly, it will be located in the Short North, just blocks from the Greater Columbus Convention Center. The concept will have four kitchens that circle a large seating area, a rooftop patio and a bar. A focus on the bar program will set Short North Food Hall apart from the competition, and guests can expect to see rotating pop-up kitchens, celebrity chefs, food truck owners and exclusive items that will make each visit a new experience. At the end of this year, Italian Village, just east of the Short North, will be home to the Budd Dairy Food Hall, a new concept from Cameron Mitchell Restaurants. 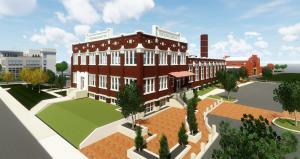 The renovated building will house eight to 10 entrepreneurial, chef-driven restaurant concepts. Designed primarily as an incubator space, the first floor will provide space for the food vendors, a main bar, community seating and a stage for live performances, while the second floor will focus on entertainment with a smaller bar, interactive games and the opportunity to be rented out for events, with catering by the food hall’s vendors. A seasonal rooftop deck will round out the offerings with more seating, another bar and additional space for entertainment. Situated along the busy 4th Street corridor, this will no doubt become a sought-after space for events in 2019 and beyond.